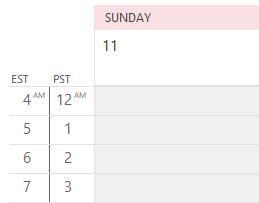 Creating any type of custom Outlook views is pretty easy. Select the folder where you want to use the new view. 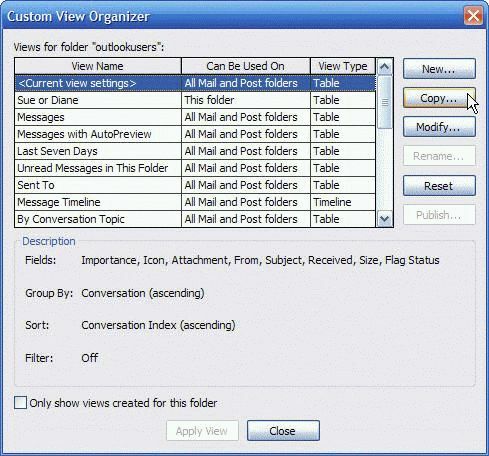 Open the Custom Views Organizer dialog – using either the Views menu on the Advanced toolbar or from the View menu. 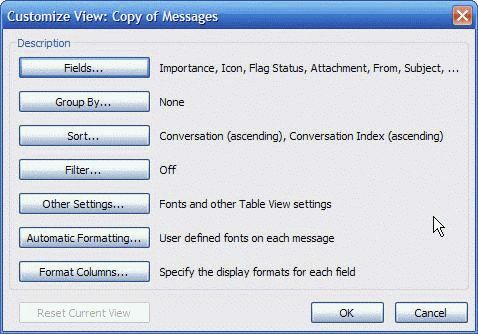 In Outlook 2003, go to View, Arrange By, Current View, Define view, as shown in the first screenshot. 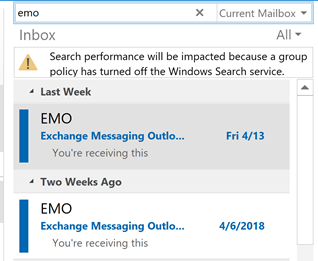 Outlook 2002 and earlier don't have the Arrange By menu, so you'll just go to View, Current View, Define view. To use the Views toolbar button in any version, scroll to the end of the Views and select Define views. Select New to create a completely new view. 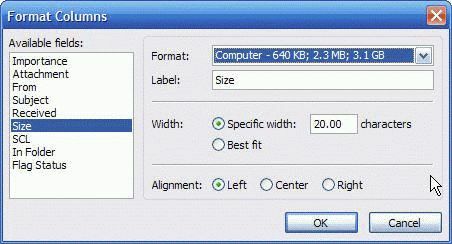 Select a view then Copy to make a copy of a view or choose Modify to modify the selected view. As a rule of thumb, it's preferable to copy, then modify views or create new ones, instead of modifying existing views. This allows you to reset the default views and not lose your customizations. The exception is when you want to modify an default view and have it applied to all existing folders. After creating the new view, select it and choose Modify to open the customize view dialog. This is the same dialog you'll see if you choose Custom or Customize current view from the context menu when you click on the row of field names at the top of a message list or by selecting from the view menu. 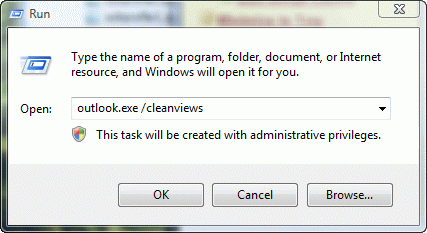 Only use these methods to open it if you want to apply the changes to the currently selected folder. If you want the view to apply to all folders using that view, use the Define views menu. If you just need to add a field to a view, you can use the Field Chooser dialog. Right click on the row of field names to display the context menu. 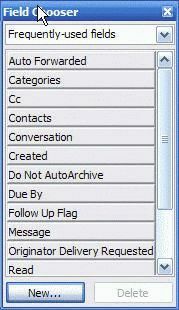 If you are using Outlook 2003, close the Reading pane or drag the inside edge to the right so the messages are each listed on one row. Find the field you need and drag it to the row of field names to add it to the view. You can add any field from any item type to any folder, however, not all items types support that field. The only harm is a blank column in your view, so be adventurous. You can always reset the view to remove all of the extra fields. Close the Field chooser by clicking on the red X when you are finished adding fields. Choose Format Columns to change the display names of any field or change the formatting of some fields, including those with icons or dates. Published May 13, 2011. Last updated on September 21, 2015. Followed your instructions, but in Customize View the "Fields" icon is greyed out. What view are you trying to customize? Some buttons are disabled in some views. On the To field's autocomplete, it only shows the addresses you've already sent to. 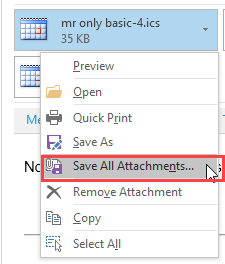 If you type a name in the field and tab out, Outlook will try to find the matching contact. Do you see the ribbon or just the words File, Message, Insert etc? If you only see words, double click on oneo f the words to lock the ribbon open.